4 fins from somewhere downunder, it seems tha downunder they have intresting non-conventional profiles. It is hard to find any pictures beside the http://www.gps-speedsurfing.com/ postings but I found a few! Timemachine TM45 22cm, full carbon fin. 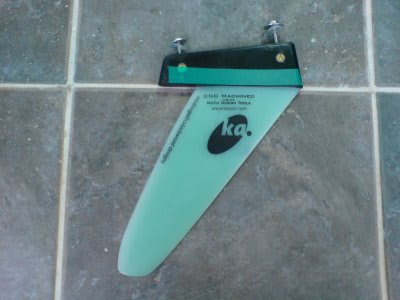 The fin has a normal rake for its length, profile thickness looks from this point quite far in the back. 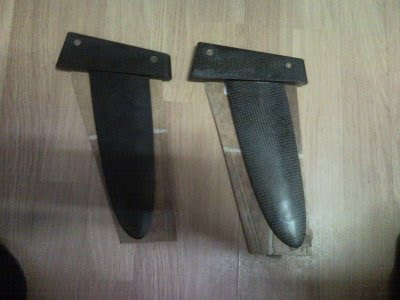 Carbon fins are famous of their quick responsiveness, if the constructor applied a good lay-up. Timemachine TM V7 23cm, assymetrical full carbon fin. 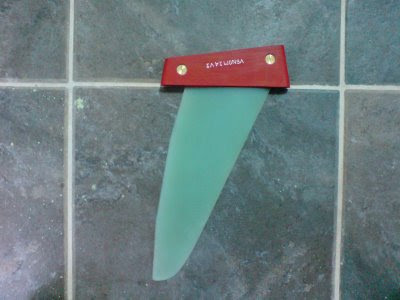 The fin has a normal rake for its length, profile thickness looks from this point quite far in the back. 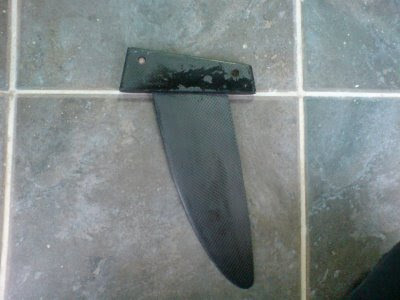 Carbon fins are famous of their quick responsiveness, if the constructor applied a good lay-up. KA Sails "Lockwood Mcdougall assymetical speedfin". Made out of G10, fin has got a lot of rake, and profile is quite thick. In theory this could be a fast vin on crosswind courses. C3 Venom 24cm, very less power for its lenght making this fin good for extreme conditions for giving lenght. Crosswind/slalom should be no problem. But when wind is a bit less it might be hard to maintain speed. With the C3-fins you have to use a bit longer fin, I think in choppy conditions this is really good. most riders might have to try to get away from the conception that the vertical length of a fin is equal to it's size or power. length has been the comparison of choice for a very long time now because it is simple, but it also is deeply flawed. sideways projected area and then considerations like profiles [especially for asy fins], flex and twist combinations and many other factors determine how a fin performs. i can't speak for the other brands fins in your comparison but in general the C3 Venom fins need to be sailed about 2-4cm longer than most other brands fins to be comparable in power because of the dynamic properties of the very thin tip in combination with G10 as a building material. we found that by going just a bit too small [even if you have no spin outs] you actually go slower. just one size up and suddenly your board flies and you have better topend and average speeds. in my opinion it makes a lot more sense to compare fins that have the same power rather than fins which have similar length. and then see how they compare for speed and trim of the board. it might take a while to get your head around the conception that longer fins [even of the same model] can actually be faster and give you more control and range at the same time. Thank you for this comment, it gives me even a better vision of the current c3-fins. If the vin has less power vs lenght you have to sail a bit longer vin. This is in some conditions very handy. Like the ISWC competitions. Longer less powered fins are on bumpy courses often WAY faster, and the advantage gets even bigger when the surfer is less experienced. I remember in 2007 I used the Tectonics falcon f1 fins. At that time I was the only one in the USM (ultimate speed meeting) with that fin. My advantage was that I didn't had to sail at the same spot as everyone did. I was getting my fastest runs about 500m more downwind in bigger chop. This was giving me all oppertunities to go after every 'clean' gust.